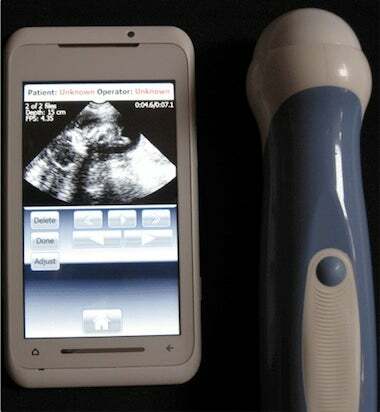 MobiUS is a simple medical ultrasound imaging system like many others—but it has one rather astonishing plus: All you need is the wand, some gel, and a smartphone. Mobisante is the firm behind the new technology, and it's just announced that the MobiUS has received FDA approval for use in the U.S. MobiUS is, according to its makers, the "world's first" smartphone-based commercial ultrasound imaging system, offering a degree of portability rarely seen before for this type of non-invasive medical imaging. It's also much more affordable than traditional ultrasound systems, which typically take up a whole roller-tray of space in doctor's offices. And, while they do offer more precise tools and a larger viewscreen, traditional models seem to rely on dedicated hardware that costs more to produce and run than a simple smartphone. MobiUS, in contrast, is small enough to slip into a bag, and thanks to the Wi-Fi and cell phone services offered by the Windows Mobile system in the accompanying smartphone, it's actually easier to share digital images with other clinicians for consults, and with the parents of unborn babies. The size, simplicity, and portability of the device is key for Mobisante's plans to boost the powers of rural and remote medical professionals, who may suffer from limited resources, and it's exactly the kind of device that could provide useful medical data in an emergency situation far from the coziness of the ER or ob-gyn unit. Considering that the FDA also just approved its first iPhone app, MobileMIM (designed to help doctors view and assess diagnostic imagery in rich interactive ways not possible with printouts), it seems the smartphone—and its larger cousin the tablet—will be a more standard feature of your doctor's medical toolset in the future. It also seems the FDA is moving to regulate the scene, which is a vital move considering the wealth of non-approved medical apps that are already available on the market. Fast Company empowers innovators to challenge convention and create the future of business.